Preaching on the Feast of the Epiphany, St. Gregory the Great tells his congregation that the gifts of the Magi are still brought to Christ every day. Whoever worships Christ according to Catholic doctrine brings the same priceless gifts the Magi brought. 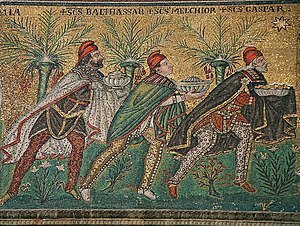 The story read to us from the Gospel properly records those days when the three Magi, who had neither been taught by the prophets’ predictions nor instructed by the witness of the Law, came to acknowledge God from the furthest reaches of the East. But we see this same thing more clearly and abundantly carried on right now in the enlightenment of all those who are called. The prophecy of Isaiah is fulfilled: “The Lord has bared his holy arm before the eyes of all the nations, and all the ends of the earth shall see the salvation of our God” (Isaiah 52:10); and again, “for that which has not been told them they shall see, and that which they have not heard they shall understand” (Isaiah 52:15). So when we see men, devoted to worldly wisdom and far from believing in Jesus Christ, brought out of the depth of their error and called to an acknowledgment of the true Light, it is doubtless the brightness of the divine grace that is at work. Whatever new light shines into the darkness of their hearts comes from the rays of the same star. It moves them with wonder, and, going before, leads the minds it has visited with its splendor to the adoration of God. But if we want to consider carefully how their triple gift is also offered by all who come to Christ on feet of faith, isn’t the same offering repeated in the hearts of true believers? Whoever acknowledges Christ as King of the universe brings gold from the treasure of his heart. Whoever believes that the only-begotten Son of God united true human nature to Himself offers myrrh. Whoever confesses that He is not at all inferior to His Father’s majesty worships Him, so to speak, with incense. Medieval legends suggest that Ismeria, a descendent of the tribe of King David, was the grandmother of the Virgin Mary. According to medieval manuscripts, the great-grandmother of Jesus was St. Ismeria. The legend of St. Ismeria emphasizes sanctity earned by a life of penitence as opposed to blood martyrdom. St. Ismeria likely served as a role model for older women during the 14th and 15th centuries. The legend of St. Ismeria marks a shift in belief, as sanctity was previously more often earned by blood martyrdom rather than piety. Click to enlarge this image. Did Leonardo da Vinci use his own shadow to create the outline of Jesus in The Last Supper? The legend of St. Ismeria, presented in the current Journal of Medieval History, sheds light on both the Biblical Virgin Mary‘s family and also on religious and cultural values of 14th-century Florence. Lawless studied the St. Ismeria story, which she said has been “ignored by scholars,” in two manuscripts: the 14th century “MS Panciatichiano 40” of Florence’s National Central Library and the 15th century “MS 1052” of the Riccardiana Library, also in Florence. “According to the legend, Ismeria is the daughter of Nabon of the people of Judea, and of the tribe of King David,” wrote Lawless. She married “Santo Liseo,” who is described as “a patriarch of the people of God.” The legend continues that the couple had a daughter named Anne who married Joachim. After 12 years, Liseo died. Relatives then left Ismeria penniless. WATCH VIDEO: Leonardo da Vinci used mirrors to hide biblical images in his most famous masterpieces. After God called her to “Paradise,” a rector at the hospital informed the Virgin Mary and Jesus of her passing. They departed for the hospital with the 12 Apostles, Mary Magdalene, Mary Salome and Mary Cleophas. There they paid honor to St. Ismeria. The legend marks a shift in belief, as sanctity was previously more often earned by blood martyrdom rather than piety. Lawless credits that, in part, to the rise in the belief of Purgatory, an interim space between heaven and hell where sins could be purged. “The more sins purged in one’s lifetime (through penitence, good works, etc.) the less time needed in purgatory — for either oneself or one’s family,” she said. Of all man’s clotted clay rhe dingiest clot? The 54th annual Swallows’ Day Parade is expected to draw 35,000 to 40,000 people to the mission town on Saturday. A street fair will feature crafts, music and games. The air may be chilly from the weekend’s winter storm, but San Juan Capistrano is gearing up for spring by celebrating the annual return of the swallows. 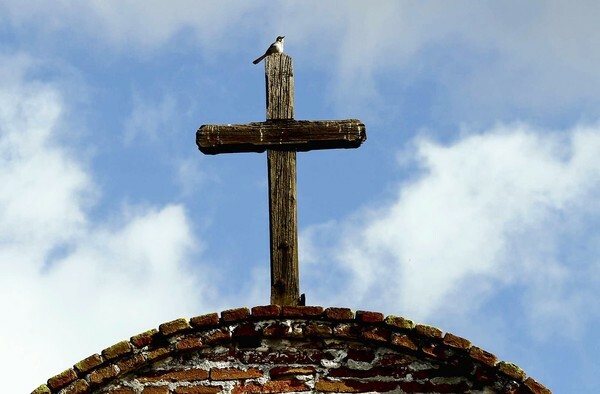 Monday was Swallows’ Day for Mission San Juan Capistrano, where lore has it that cliff swallows return each year just in time for St. Joseph’s Day after wintering 6,000 miles away in Argentina. Although the gregarious birds have hardly been seen at the historic mission in recent years, swallows nest in small numbers elsewhere, in the eaves of schools, shopping malls and underneath freeway overpasses. They can often be seen feeding on insects early in the morning or at dusk. San Juan Capistrano will hold its 54th annual Swallows’ Day Parade and street fair Saturday, featuring about 3,200 participants, more than 500 horses, 11 marching bands and dozens of entries that celebrate the city’s Spanish, Western and Juaneno Indian heritage. This year’s festival theme is celebrating the Old West. About 35,000 to 40,000 visitors are expected to attend what has become one of the largest non-motorized parades in the nation. The 1.5-mile parade is to begin at 11 a.m. on El Camino Real at Ortega Highway and move along Del Obispo Road to Camino Capistrano, then head north back toward the Mission San Juan Capistrano. The parade is expected to last more than two hours. The Mercado Street Faire will be held from 9 a.m. to 5 p.m. at the historic Town Center Park off El Camino Real at Ortega Highway. Organizers say the fair will feature about 100 vendors selling crafts, clothing, games, food, beer and wine. Rick and the Working Cowboy Band will provide country western music. San Juan Capistrano will close its streets in the festival and parade area at 10 a.m. Motorists can find parking on the perimeter of the event. Shuttle service will be available at the Endevco and Fluidmaster parking lots off Rancho Viejo Road or at the San Juan Capistrano Community Center and Sports Park off Camino Del Avion near Del Obispo. The shuttles will run from 8 a.m. to 5:45 p.m. The cost is $2 for a round trip. Children under 12 are free. Metrolink commuter rail service also will be available. For more information, call (949) 493-1976 or go online to. One of the most profound verses in Scripture, says St. Cyril of Alexandria, is the little verse where Luke tells us that Jesus grew up in the ordinary human way. “And the child grew and became strong, filled with wisdom; and the favor of God was upon him” (Luke 2:40). To say that the child Jesus grew, and became strong, filled with wisdom, and the favor of God was upon Him, must be taken as referring to his human nature. Look closely how profound this dispensation is: the Word tolerates being born in human fashion, although in his divine nature he has no beginning and is not subject to time. He who as God is all perfect, submits to bodily growth: the Incorporeal has limbs that advance to the ripeness of manhood. He is filled with wisdom who is himself all wisdom. What can we say to this? By these things he who was in the form of the Father is made like us. The Rich is in poverty; the High is in humiliation. He who, as God, possesses everything, is said to be “filled.” So thoroughly did God the Word empty himself ! And the things that are written of him as a man show what kind of emptying it was. For it would be impossible for the Word begotten of God the Father to admit anything like this into his own nature; but when he became flesh, a man like us, then he was born according to the flesh of a woman, and is said also to have been subject to the things that belong to human nature. Though the Word, being God, could have made his flesh spring forth at once from the womb as a complete and perfect man, yet this would have been of the nature of a portent: and therefore he gave the habits and laws of human nature power even over his own flesh. 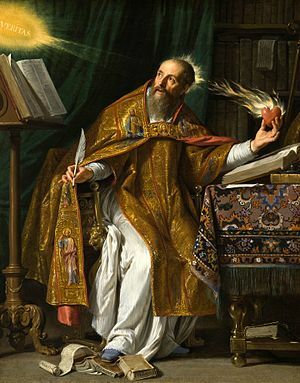 St. Augustine carefully worked out what has become a famous formulation of Christian ethics: love the sinner, hate the sin. Even the sinner is good by nature. If we’re careful to distinguish the sin, everything else is worthy of our love. But the character of the human will is important here. If it is wrong, these motions of the soul will be wrong; but if it is right, they will be not only blameless but commendable. So the man who lives according to God, and not according to man, should be a lover of good, and therefore a hater of evil. And since no one is evil by nature, but whoever is evil is evil by vice, whoever lives according to God should hold a perfect hatred toward evil men. He should not hate the man because of his vice, or love the vice because of the man. Instead, he should hate the vice and love the man. Once the vice is cursed, all that should be loved will remain, and nothing that should be hated. It’s human nature to try to make excuses for our sins. 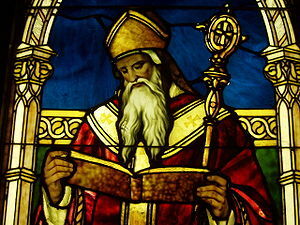 But we shouldn’t do it, says St. Augustine. We’re only making the sin worse by showing our ungodly pride. 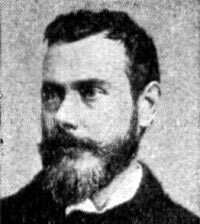 But it is a worse and more damnable pride that looks around for the shelter of an excuse even in obvious sins. Our first parents did just that: the woman said, “The serpent beguiled me, and I ate,” and the man said, “The woman whom you gave to be with me, she gave me fruit of the tree, and I ate” (Genesis 3:12-13). No begging for pardon, no appeal for healing. They did not deny (like Cain) that they had done the thing, but their pride tries to push its wickedness off onto someone else—the woman’s pride to the serpent, the man’s to the woman. But where there is a plain breaking of a divine commandment, this is accusing yourself instead of excusing yourself. The fact that the woman sinned on the serpent’s persuasion, and the man on the woman’s offer, did not make the sin any less—as if there were anyone we ought to believe or yield to rather than God.